Guide price from £1.00 / sq.m. This service is available to all clients large or small. Our floor plan surveys are accurately measured on site by modern, "state of the art" Leica Laser Distance Measuring equipment linked to laptops running MBS software to survey and record the floor plans. 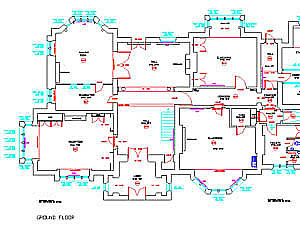 All our surveys are drafted electronically using CAD using MBS, LSS and AutoCAD V14 and V2007. As a result all our output data is available as either digital data or as a traditional paper plan. Located in Leicestershire SV Surveying Ltd is based in East Midlands but works throughout the West Midlands Nottinghamshire, Derbyshire, Lincolnshire Northamptonshire, Warwickshire, Staffordshire and has several clients in the London area plus operating throughout the rest of the UK and abroad. 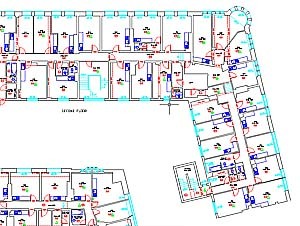 Our surveyors have at least 12 years experience in the surveying of building floor plans, working on a variety of projects from small domestic properties and churches to large industrial complexes, institutional buildings and schools. The surveys are available via email in the following formats LSS model file, LSS load file, AutoCAD .DXF, or DWG, MBS, MX MOSS Genio and Microstation. If you require another format give us a call we will probably know a way around the problem or will be able to convert the data into a compatible format for your system. Download PDF Information Sheet. - Floor Plan Information. Download PDF Information Sheet. - Elevation Plan Information. Download PDF Information Sheet. - Topo Survey information. Download PDF Example. - Survey example.